If you are usually working with large worksheets, it is really important that you become familiar with the steps to Freeze Rows and Columns in Excel. As you must have noticed, the Column headings go out of view and are no longer visible when you scroll down in an Excel worksheet. Without the Column headings being visible, it becomes really difficult to enter new data in to proper Columns or to review and compare the existing data. A simple solution to this problem is to simply Freeze the entire Row containing Columns headings. Once this is done, the Column headings will become frozen and will always be visible when you scroll down. 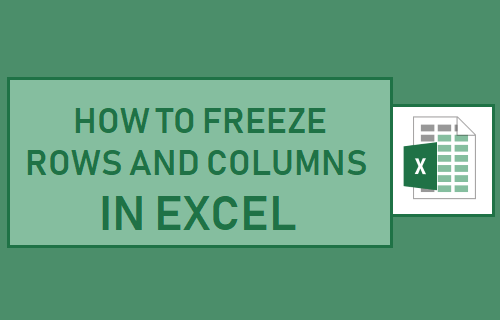 Similarly, it is possible to Freeze Columns and also Freeze both Rows and Columns at the same time in Excel. Note: Freezing Rows or Columns has no effect on printing, it only affects the way that worksheet appears on the screen. In case you want to make the Column Headings stationary and always visible when you scroll down, you can follow the steps below to Freeze the Row containing Column headings. 1.1. Select the Row (or the first cell in the row) located right below the Row that contains the Column headings. 1.2. Next, click on the View tab > click on Freeze Panes and then click on Freeze Panes option in the drop-down menu. This will freeze the Row containing Column Headings and this particular Row will always stay visible when you scroll down the worksheet. 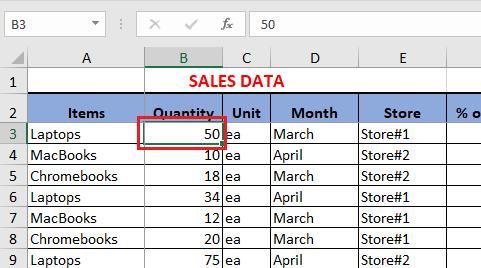 If the worksheet spans multiple columns you may want to make certain column/columns always visible when you scroll to the side on the worksheet (Right or Left). 2.1. Select any Cell located immediately to the right of the Column that you want to freeze. In our case, we have selected Cell B2, in order to Freeze the Column A containing “Items”. 2.2. Next, click on the View tab > click on Freeze Panes and then click on Freeze Panes in the drop-down menu. In certain cases, you may want to Freeze the Row containing Column Headings and also Freeze the first column or few selected columns in the worksheet. To Freeze both rows and columns, select the Cell located to the right of the Column that you want to Freeze and below the Row that you want to Freeze. In our case, we have selected Cell B2 in order to Freeze the second Row containing column headings and also Freeze Column A containing “Items”. After selecting the right-cell, click on the View tab > Freeze Panes > Freeze Panes option in the drop-down menu. Now the rows above the selected Cell will remain frozen when you scroll down and also the Columns to the left of the selected Cell will also remain frozen when you scroll to the side. 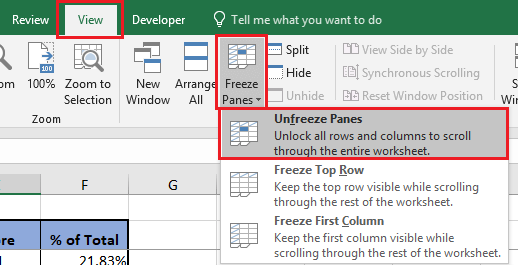 At any time, you can Unfreeze Rows and Columns in Excel by clicking on the View Tab > Freeze Panes > Unfreeze Panes option in the drop-down menu. The Frozen Rows or Columns will become free and they will no longer remain frozen or stationary when you scrolled up or down. You may come across an issue where the Freeze Panes option is not available, appears grayed out or it does not work. This issue is usually related to the worksheet being in “Page Layout” view. To fix this issue, click on the View Tab and then click on Normal or Page Break Preview. Freeze Panes option can also get disabled due to the workbook being in protected mode. However, this issue has been fixed in newer versions of Microsoft Excel and you will only face this problem while working on files created using an older versions of Excel (older than Excel 2013).